Your wedding is one of the most important days of your life. It can also be one of the most stressful as everything has to be perfect. Brush Hill Tours can help by providing the transportation for your wedding party. Our beautiful, San Francisco style trolleys are a unique style of transportation for you and your guests. Imagine the the wonderful photo opportunities aboard the Beantown Trolley! 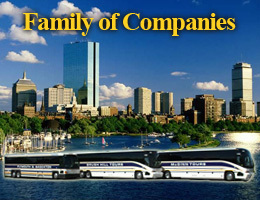 Motorcoaches are also available for wedding transportation and can accommodate even larger groups. Allow us to make your special day even more memorable! To make sure your trolley or motorcoach is available for your special day, call our sales staff now at 781-986-6100.